Shortest window between project completion and broadcast of anything I have been involved with, ever. And here's a look at some (not quite all) of the work screened. This old Yolngu kid's song is included in a song book and CD the school made (I have to dig it up to give proper credits), sung by younger kids at the school. From what I could see everybody in Yirrkala knows this song! 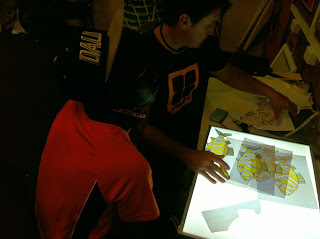 So it was a good one for the students to work with for animation. Click the 'read more' button at the end of thispost for a translation of the words. 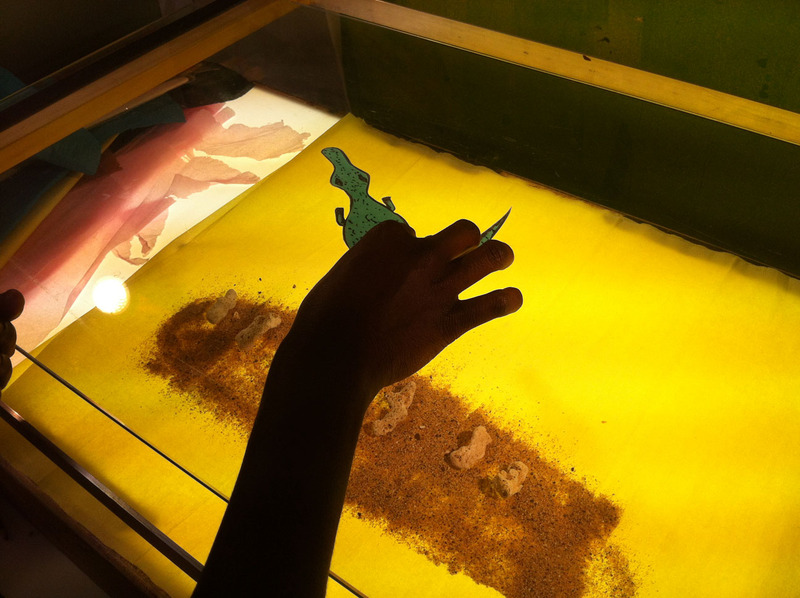 As well as aiming to create a finished video to go with the Animal Song, the kids did a lot of experimenting with animation, which for the screening was collected and screened with some (banging!) electronic music created by some of the students. This is just a sample. Students experimented with capturing themselves performing dance moves and transformations into totem and other important animals/ plants (and in the case of one group even transforming into each other), and also with transforming colour and pattern of shapes like the butterflies you see here. 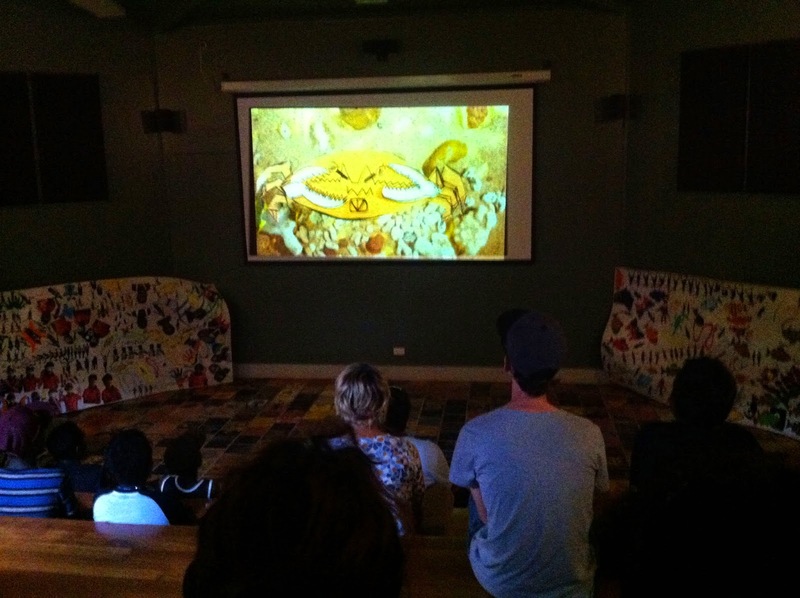 And Djayila, Guti and Pumpkin's animated definition of animation, with music by Djayila, was a very appropriate way to kick off the screening. A short and super productive session with a small group today. Preparing crab designs for the children's song book. 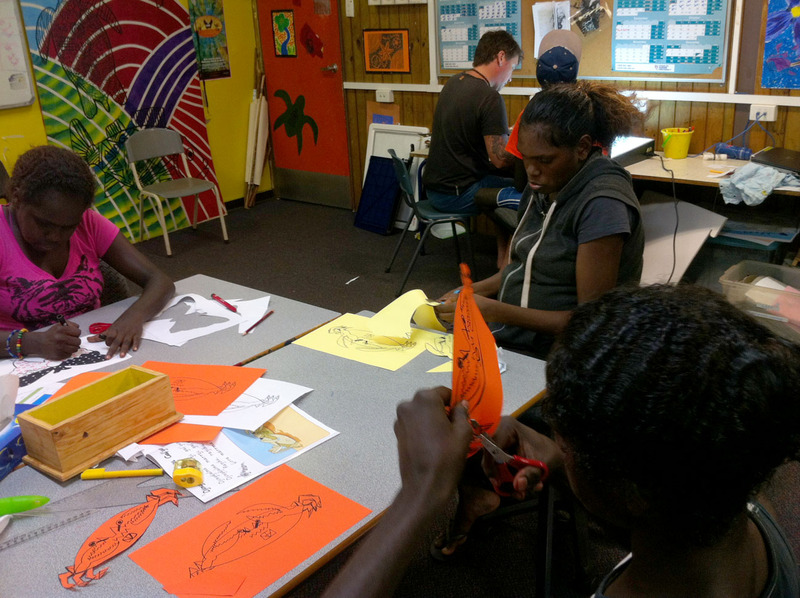 Creating multiple frames of moving patterns on the fish and butterfly, a great idea Justin had, using some of the existing pattern designs the students have made. Really looking forward to seeing how these look animated. Nikita worked with me to animating the crocodile designed yesterday by another student for the children's song book. Nikita also put together the background. Here he is with multiple sets of nostrils for a nostril flare (the song talks about his long nose so this is one way to draw attention to it!). Some lovely images created today. Some Year 1s came in with fishes they'd coloured in to see a demonstration by Nikita and I of how the animation process works. Bawu traced around her hand and she and Gurmarrwuy started making different designs with the outline. They had their first go animating with a short loop of their designs interchanging with Bawu's real hand. I liked the hand designs so much that we got more people to make them and now have a collection of these. Guti animated his kangaroo transformation which he created a beautiful background for. 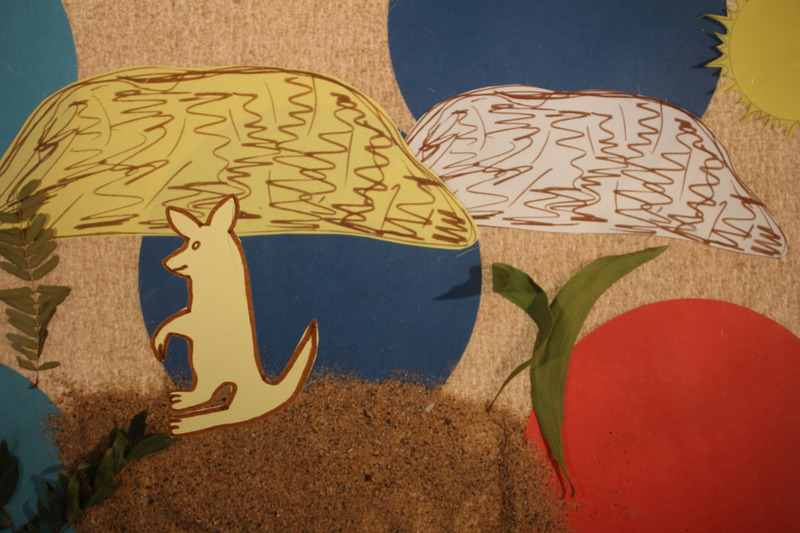 Here's a snapshot, with a kangaroo design contributed by Nikita. I love it! 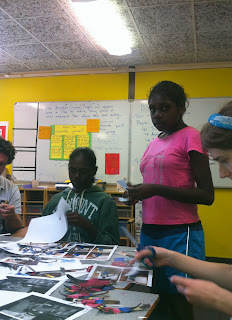 Justin had the great idea of a group activity for Year 7s, animating their faces assembling over the top of each other. This was good because each student could take a turn animating his/ her section and the results are really pleasing. Some students started designing letters of the alphabet to potentially animate. Nyalic animated his mask portrait cycle. 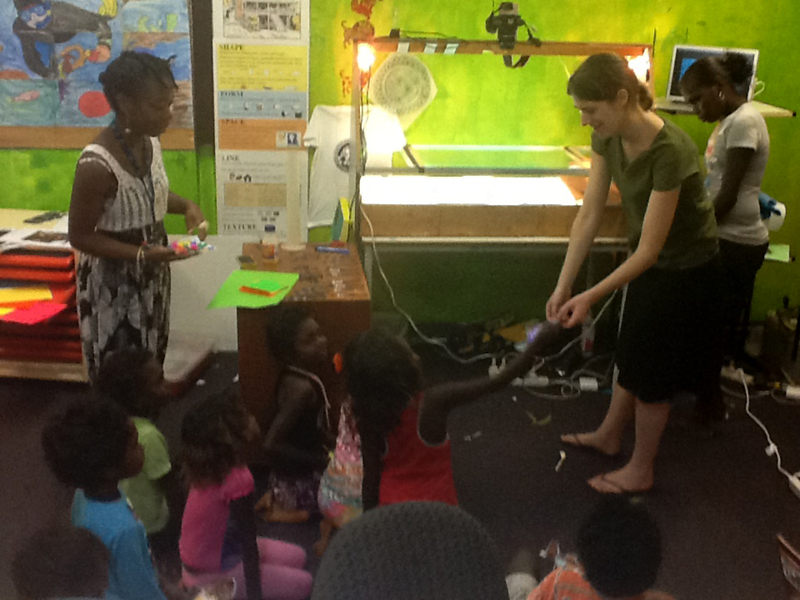 Today Edwina was away but Nikita animated the coconut tree and dragonfly. She animated the first section on her own, then the second section with Guti and Josefa (don't know if I'm spelling that right?). 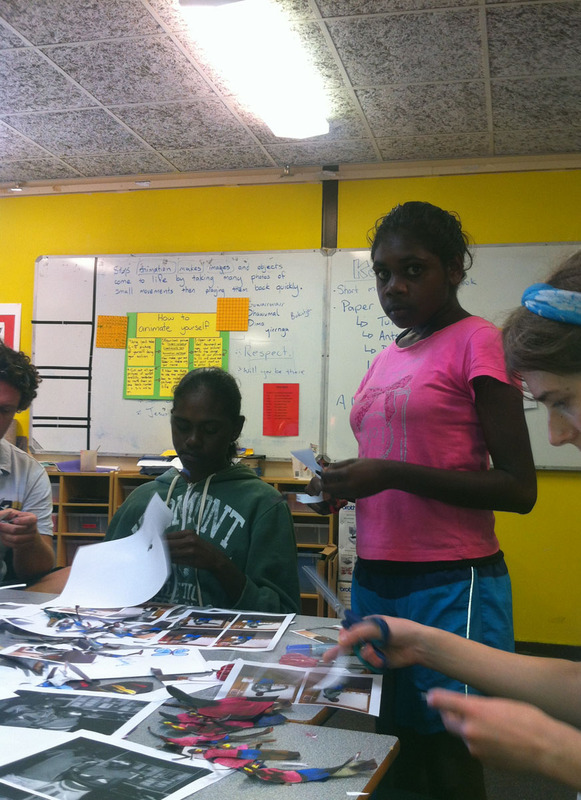 Lee worked with a few of the girls to capture more images to animate, including an epic 50-image basketball animation from Pumpkin, then got a production line going to cut them out. We had a 4-frame dance-move ready to go, which was animated by Bukutjpi and a guy whose name I need to find out. 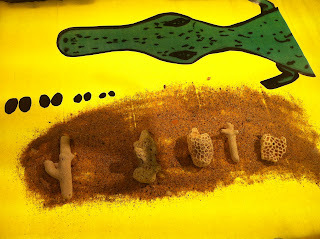 We also added some more fish to our collection. We have some amazing dance moves animated. Dancing by Guyulutja and Djayila, animating by Guti, Djayila, Pumpkin and Guyulutja. Djayila decided to add cut-out speakers to his background and also has some lightning bolts ready to animate in his next session. I'm hoping some of the students will make some music and these can maybe edit together with the animal transformations into a music video. Dance moves from Kate Matthews on Vimeo. 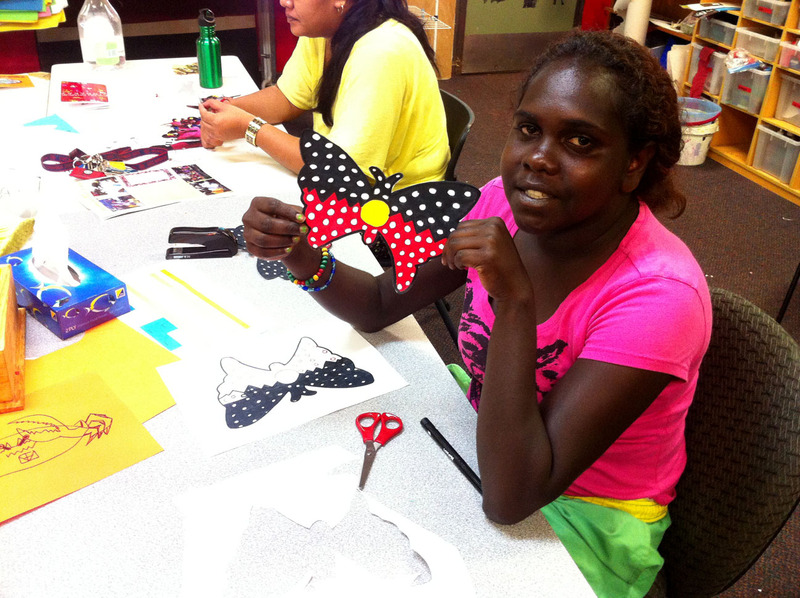 Edwina and Nikita are visiting from a homelands school for a couple of weeks. Pumpkin and Guti showed them how to animate, using the long neck turtle. 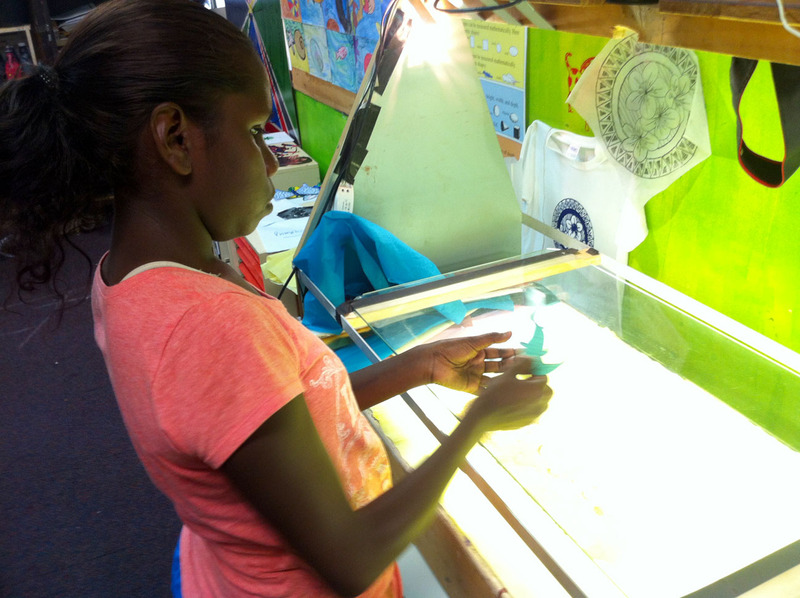 Edwina has chosen a dragonfly to transform into and Nikita a coconut tree. They'll animate them together in one scene. The designs are ready to go and they look beautiful, I can't wait to see them animated. With our Bäru transformation ready as an example, a number of students have started working on transformation animals. So far we've animated 3 butterfly transformations and have a coconut tree, dragonfly, fish, kangaroo and snake on the way. 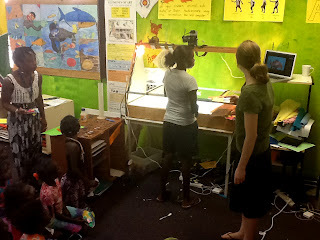 Sometimes the students animate their own pictures - sometimes they prepare them and other students animate.